Anyone seeking to go on holiday during February half-term or the autumn half term with children would appreciate booking a self-catering cottage with its own heated swimming pool. In Britain, a heated pool would be indoor only, outdoor pools are usually heated from May until the end of September only. February half term is a difficult time to find somewhere suitable for a half term break. Most children have only a week's holiday which limits the distances one can travel. A holiday at home in Britain with use of a heated pool solves many problems. Families could enjoy a happy hour or more in the pool each day, go for walks and cycle rides. 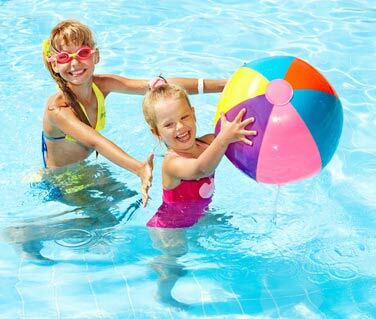 Almost every child loves to have a holiday based around the swimming pool. Our weather in Britain for outdoor pools is limited to the height of summer although solar heating helps to drive down costs. There are some really brilliant holiday cottages in holiday parks around the UK, with a communal swimming pool or leisure centre, that offers a heated pool all year round. This easily accessible entertainment is valuable to families with children who would really make the most of this amenity. The pleasure is increased if guests are permitted to bring their own inflatables for the children to play with. It can be endlessly amusing to tip a sibling off a lilo.